FRIDAY POST ~ Welcome and do enjoy the 'remembering painting' and my haiku for the season. Change, transition is a type of 'limbo' place. Whether it is in reaction to seasonal changes, creative work, or life issues, it can be a rather unsettling place to be. Know that it is all part of the process in exploring and expanding the creative spirit. Hope you will check out the very creative blogs above and enjoy. Wishing you a peaceful and delightful weekend. Nicely done. Liked the spiritual angle of the last. 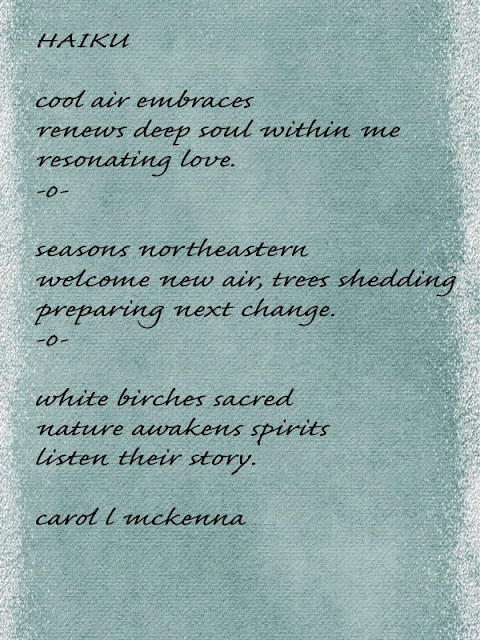 What a treat Carol, these haiku, inspired on the one by Basho, are breathtaking. What can I say more? I am speechless and can only be a silent reader. Thank you for participating in Carpe Diem. and the Haiku is lovely too. I hope that things are well with you Carol. But the good thing is that I got to say hello today! How lovely and peaceful. Have a wonderful weekend. 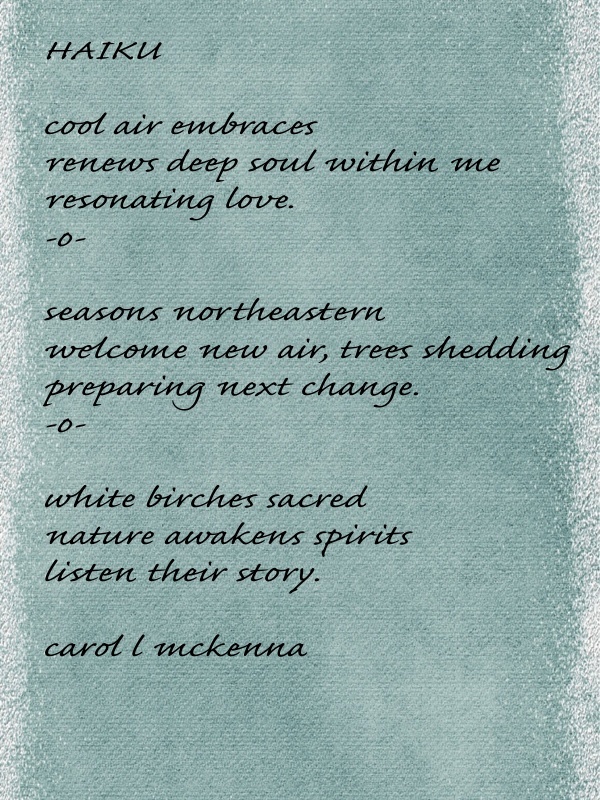 Beautiful haiku that embrace the changing of the season! thank you for being here carol sharing your haiku love at recuerda mi corazon! Hi Carol. Good to see you as always. Love the angel so peaceful looking. Enjoyed reading your Haiku's as well. Always enjoyable. Regards to ArtMuseDog. Have a wonderful weekend. Lovely, and I love the Eric Masel quote. Thank you for this reminder of change... the preparation and the shedding... it is a very special and sacred time indeed. The prayers of remembrance once again paints the sky with hope... so lovely Carol. Carol, the painting is lovely. Also, your haiku poetry is very beautiful and thoughtful. As usual, beautiful haikus! I love the nature theme. Beautiful painting and touching, wonderful haikus. HPPF! what a lovely second in series and your haikus are truly beautiful! Happy PPF! I loved the haiku ... cool embrace !!! I like that last line "Listen their story" Beautiful haiku and I like the background you have it on! Have a great weekend! I don't really like change but it does making life more interesting and is inevitable. HPPF. so, so beautiful Carol... the last haiku really touched me deeply. I love the renewal in the changing season too! Some folks embrace change, others deny it, yet it happens and is one of life's miracles; when the seasons change, when cells divide and become a spirit, any time the sun rises. We can watch the sun move across the heavens and the leaves change their color. I'm willing to watch these miracles as they happen, and I embrace your thoughts about it here. Sweet words and art! Pretty soft colors too!! I especially like your first and third haiku - and love your praying angel. I love the peaceful feeling to your sketch.... and the beautiful Haiku. Beautiful painting and love the word to your Haiku! And your haiku's are beautiful...and gorgeous on that serene blue background, too! She is so serene and sweet! Lovely poems too. What a sweet, comforting little spirit. She would be lovely in a child's room. I always enjoy your wonderful paintings, serene photos and haiku. Thank you for your comments on my blog. I like the complimentary colors of blue and orange. 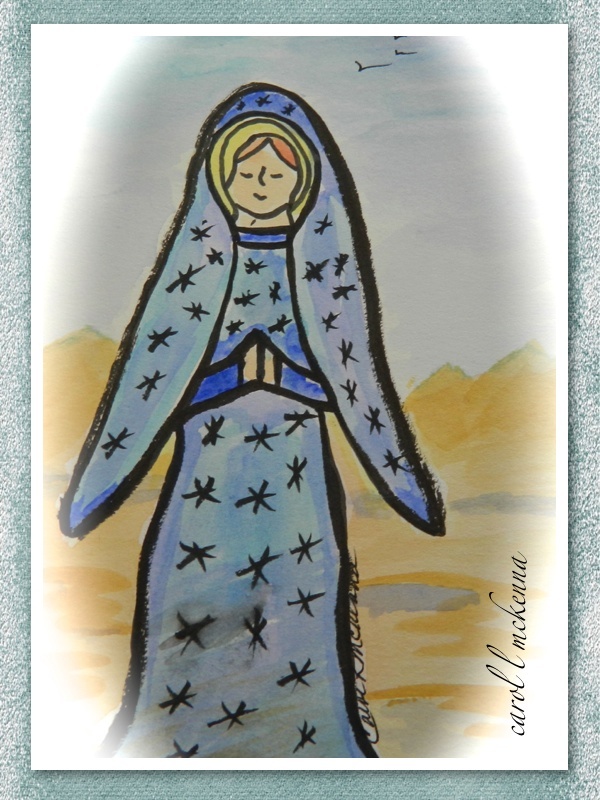 It seems she is in the desert alone, but not alone! White birches...white poppies...white clouds--all things have stories, if only we will listen! Lovely haiku and painting to accompany it.